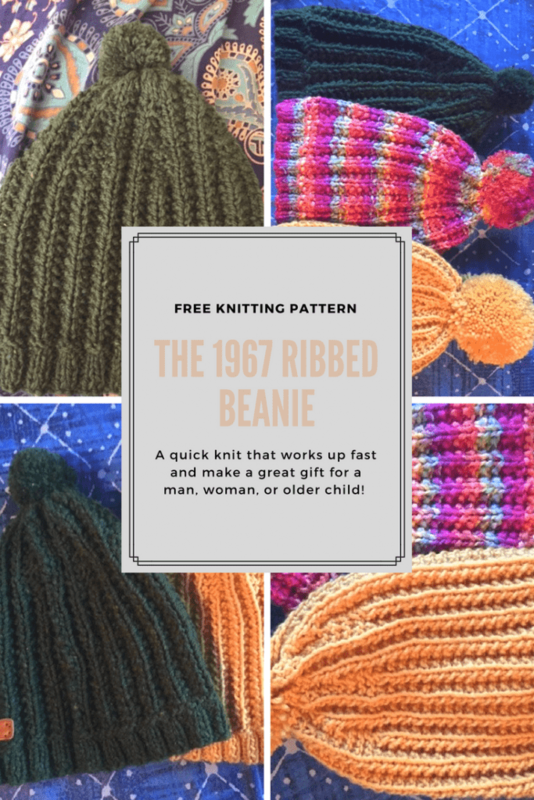 The 1967 Knit Beret did NOT work up like the picture showed but the finished result is beautiful and the pattern is here for free. Since I wanted a ribbed hat I did the obvious thing and designed my own! This pattern is a little harder than the beret but still uses only basic stitches. 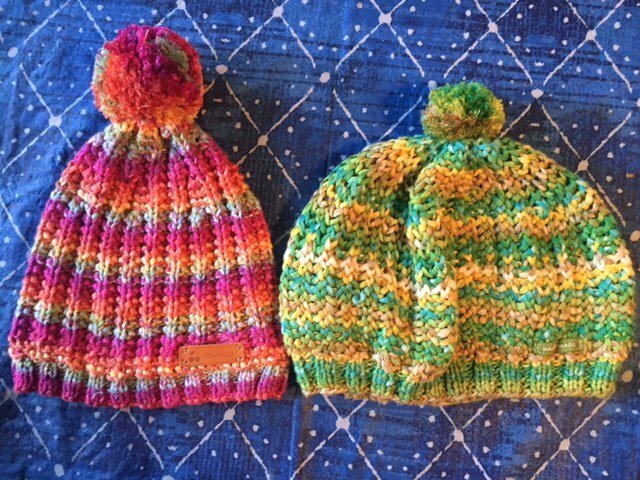 Both hats knit up flat and are seamed shut. I do believe this hat can be blocked to be a beret as well, but since I’ll wear a beanie and not a beret I didn’t test that theory strongly. I know a plate does fit inside for the classic way to block a beret. When done in a silky material is does still fit like a beanie. 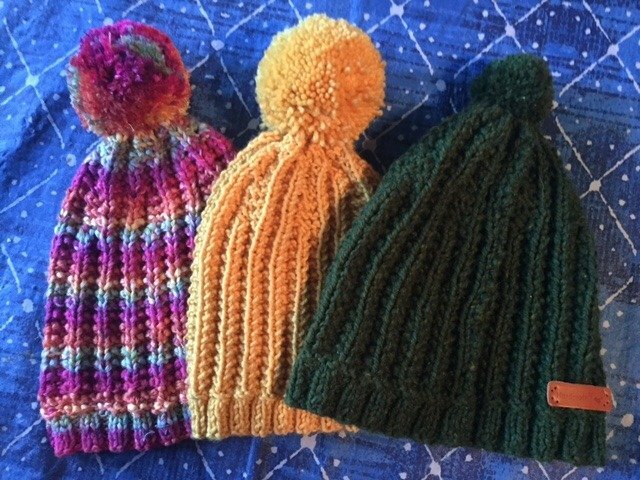 My Samples are made using: Nicole Studios “Paintbrush” Yarn- bright beanie and the 1967 beret, Peace Fleece wool- green Ribbed Beanie. Cascade 220 Superwash- Yellow. The silky Paintbrush yarn does create a loose drape, while the stiffer wool is thicker and warmer. The Cascade worked up loosely and is more stretchy. Any worsted weight yarn will work. You can see the beanie here on the left, and the beret on the right. If you’d like to use this stitch for another pattern you need a cast on of a multiple of 4, plus 2. Knit 1 row with 8 evenly placed k2tog- The spacing doesn’t have to be perfect, just don’t bunch them all together. Knit in pattern stitch until piece is 6″ (including ribbing.) 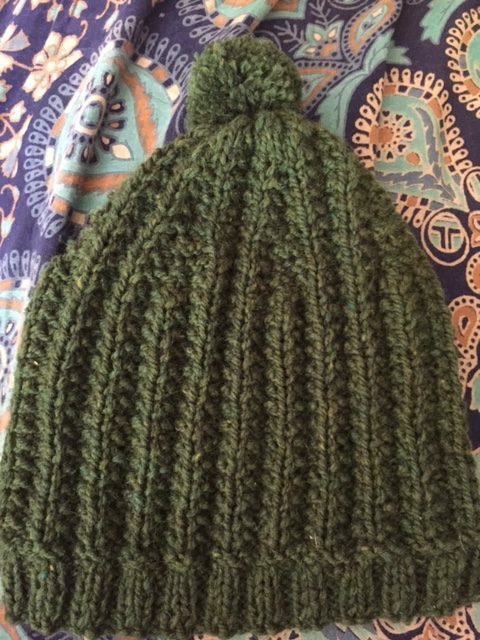 If you have more than four ounces of yarn you can extend this to make a longer beanie. The rows are the same as the original patterned stitch. Repeat these for 5 total rows after the decrease row. Following Row- *p3, k3 repeat to end p2 If you have picked up the pattern at this point, this row will feel wrong! Everything that has lined up until know will look like it’s getting messed up. Don’t panic! Put a lifeline if you’d like and just keep going. Fourth decrease- p1, p3tog (purl three stitches all together as one stitch) End off yarn and leave 12″ end. Run the end through all the remaining loops and pull tight. Sew seam. One side will look better and have a better rib pattern, that should be the outside of the hat, but it is technically reversible at this point. Use remaining yarn to make a pom pom and sew it to the top. My green sample has a 1 1/2 inches pompom, but the rainbow one needed more fluff! It has a 2″ pompom! My yellow also has a 2″ pompom! This pattern is on Ravelry! Please don’t hesitate to contact me with ANY questions or problems! 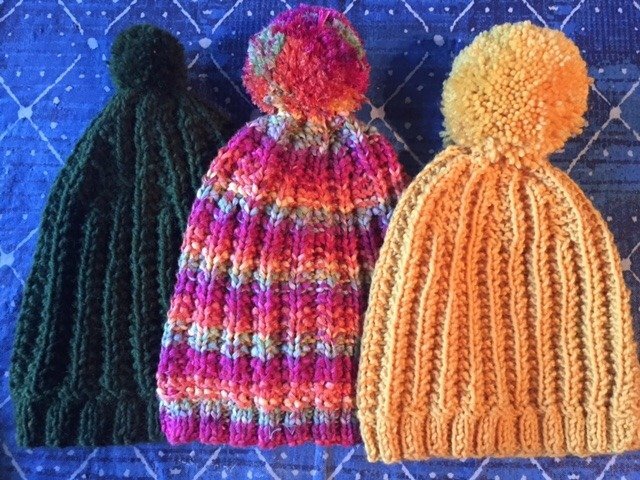 I’d also love to see your finished hat!